Magical experience playing the guitar for an event just outside of Arundel. The setting gave perfect acoustics and a beautiful landscape. The natural acoustics were ideal and as such I enjoyed playing some of my most beatiful sensitive repertoire. My host loves the sound of the Spanish guitar and so it was important to her that there should be beautiful, sensitive Spanish guitar music playing in the background. I was very happy to have the opportunity to try to provide just that. The event guests were lovely people and several made a point of coming over to me to chat about my music which I thought was very kind. I had a brief chat about maybe going back one day together with my flamenco dancers and singers and I would love to do that. From the moment I arrived they could not do enough for me. They had already set up a very sensible playing area for me in their beautifully designed garden. They wanted me to be comfortable. 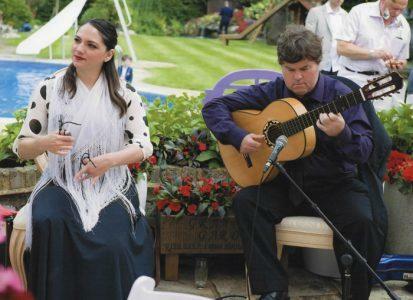 The guests were lovely gentle people who enjoyed my playing of Spanish flamenco and classical pieces. 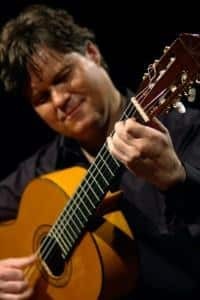 My hosts are especially keen on Spanish guitar because they spend frequent time in Spain where they listen to Spanish guitar playing live and have gained a kind of intuitive (non-academic) understanding of this genre of music. You don’t need volumes on flamenco when you can feel it in your heart. Some of the guests either requested particular pieces which in some cases were in my repertoire or stopped to chat for a while about the pieces that I had chosen to play and to reminisce about the times they have heard guitar in Spain. You know you have a great audience when they recognise pieces and /or just feel that they would like to chat a while in acknowledgement of the work that you are doing with your playing. The skies decided to reward us with Spanish sun, (what is going on this summer!!) and the whole event was wonderful. When it was over it was a long drive back, especially because an incident on the motorways meant I had to recalculate my route, thus adding time. But that was no problem to me. I was very happy and drove home peacefully with good memories of a lovely gentle evening in Tunbridge Wells. I was very pleased to be contracted to play a mixture of Spanish Classical Compositions and Flamenco pieces for a private party held at the Hispania Spanish Restaurant in London. I had prepared a very varied selection, each piece with its own characteristics and mood. I imagined that people would like Asturias by Albeniz and Recuerdos de La Alhambra by Tarrega because these are such well known and popular pieces. However, I was also very pleased that several people recognised and commented on other less well known pieces. When playing flamenco, I am never entirely sure how it will go because the word flamenco evokes different feelings to different people. I did not need to have any concerns; these flamenco pieces were also very well received. There were several Spanish party guests and I thought it very kind of them to take a few minutes to come over and chat and tell me how much they enjoyed my playing; or to be little less modest some of them were very familiar with flamenco guitar playing from attending concerts on Spain and were very complimentary about my playing. I suppose it is not the humblest thing to repeat that here but I think performers of all fields know that we do need to have feedback, we genuinely value all constructive criticism (provided we are genuine) and of course we are encouraged when people with real knowledge and experience and high expectations give us positive feedback on our work. The host had explained to me before the event that he had a special affection for South American music and so I was very happy to prepare a few South American pieces whether within the flamenco repertiore or otherwise. Hispania seems to be a rather up market Spanish restaurant and some very exquisite tapas had been prepared for this event. One chef had the sole responsibility of cutting and serving Jamon Serrano 5 Jotas which if I am not mistaken is Jabugo Bellota and as such rather spectacular. One of the perks of being a flamenco guitarist is that waiters bring you plates of Jamon 5 Jotas! A luxury evening for me playing for a lovely private party at Hispania Restaurant London. A totally magical experience playing a selection of flamenco guitar solos and Spanish classical pieces for very appreciative hosts and guests at the special birthday party for the Spanish hostess. 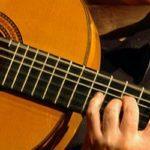 Both the hostess and the host frequently listen to, know about and love Spanish guitar playing. Knowing this confirmed to me that I would be free to offer my entire repertoire with all the flamenco moods. They had set up a magical shaded area for me under a tree in their delightful garden; they had taken the trouble to organise an electric extension lead for my amplifier, a small table with table light and plenty of refreshments. They had also set up rows of chairs and organised the timings so that people could come and sit down to hear my recital after they had eaten. When people go to this kind of effort you know that they really do want to have you there playing Spanish guitar. So, I felt great and played many pieces including several that I normally only perform to audiences with flamenco experience. These pieces might be for example Tientos, Granaina, Tarantas, Soleares. This is because in a way flamenco can sound kind of abstract without a clear and obvious theme going through the piece. This was of course intentional in the origin of flamenco; not so much a music, rather flamenco came about and especially in the singing to be an immediate expression of profound and often tragic emotions. As the art form developed not all of the pieces were sorrowful but the powerful passion and emotion still remains. In a way those emotions are also present in Spanish classical pieces and it is possible that the Spanish composers were influenced by flamenco which surely would have been very present in Spanish culture. All of these thoughts were in my mind as I played because I was in an environment which was conducive to concert standard playing. I am not sure if all of the guests would have had the same extent of knowledge about Spanish music but it was very clear that they did indeed understand and feel the emotions in the music and I was grateful to them for their applause. I will remember this one as very special. 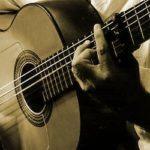 I played Flamenco guitar music for a wine tasting event where the organisers wanted the mood of the music to match the character of each wine. I understood the idea and wanted to play flamenco music that really did suit the event and that helped to create the Spanish atmosphere. Thus, for a very robust red wine I chose a strong and serious piece such as Soleares. For a lighter red wine with more fruit I thought that Bulerias might be appropriate. The white wines were more complicated because certainly one of them has a lot of body and quite a rich colour and in this case, I considered Granianas or Alegrias de Cordoba. While for the brighter and lighter white wine I played a rather fast and fun Alegrias de Cadiz. When Alegrias is played in the style of Cadiz it is always in a major key but in the style of Cordoba it is almost always in E minor. For the Rose wines I felt that the flamenco pieces of South American origin such as Guajira and Colombiana really accompanied the delightful Rose wine. I thought it was important to explain that Flamenco comes from Andalucia and many wines come from other regions of Spain and as such there could not always be a geographical paring between wine and music. 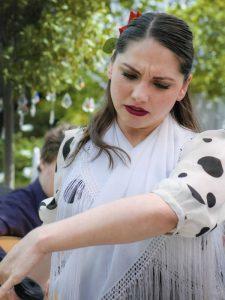 Nonetheless some of the flamenco pieces came to Andalucia as pieces from other regions in their original form. Farruca from Galicia, Garrotin quiet possibly from Asturias and of course I also play the classical piece called Asturias by Isaac Albeniz. Then we have Caracoles from Madrid, Sevillanas almost certainly originally from Castilla and all of the mining laments such as Tarantas, Mineras, Cartagenera, Levantica from the eastern levante region. Thus, by understanding the wines themselves and then thinking about my flamenco repertoire I was able to provide flamenco guitar music that was entirely in character with the event. It is sometimes said that back in the late 19th Century flamenco was used at events to promote wines and foods typically at places called ‘ventas’. It was very good in the early 21st Century to play for a similar event. Playing the guitar for a funeral is a very particular and specific skill and the guitarist needs to be very aware of what is needed and able to respond to the client’s needs. Sometimes the family of the deceased feel that it would be appropriate to have music at certain moments during the funeral service. If they have chosen guitar this will be because guitar music has been important to the deceased in one way or another. They may have been a guitarist themselves, or simply enjoyed guitar music or perhaps the sound of the guitar has a specific reference in the hearts of the family. It is then important to discuss the type of music with the client. It is not just a matter of selecting repertoire although certainly there may be certain pieces that they would like to be heard. It is also important to talk about the moods for each piece. Although a funeral makes us immediately think of a sorrowful mood there is rather more to it than that. Some people will want a restful mood while other people may need something a little stronger and perhaps uplifting at a given moment. In my case I am sometimes asked to accompany a reading with guitar music. In this case it is helpful to meet with the person who will recite the text so that I can understand their pace and flow as well as the elements in the text that they want to emphasize. Very often I will play music as the mourners arrive and again as they leave and again these are chosen carefully to provide the correct background atmosphere. A funeral is a time of tears and lament and the readings are often most touching. Additionally I find that I become aware of and influenced by the sadness around me and it is at this point that it is most important to remember that we the musicians are providing a service to the mourners and that the purpose of our work is to be helpful to them. As such composure is required. I will chose music that will be especially lovely as well as the right choice for each funeral and naturally the situation will be moving for the guitarist as well but being professional we understand decorum and how to behave appropriately. On this note we the hired guitarist must always be impeccably dressed and I always ask if there is any particular colour that they prefer or that they wish to not have. At one funeral it was very clear that black was not wanted and that this was in respect of the deceased’s wishes. Acoustics in churches often means that amplification is not needed but if it is I arrive very early to set up in advance of the start of the funeral and not until the last person has left do I begin to put the guitar away and collect my things together. The early planning with the family member who officiates the service as well as a member of the clergy where this is the case should mean that my guitar playing should go smoothly but I am always very attentive to what is happening and ready to make changes should they be needed. Finally, when it is the right time I leave quietly and discretely. I had the exceptional pleasure of performing a recital of music by Paco de Lucia and Paco Pena or to spell in Spanish Paco de Lucía and Paco Peña for a private event in St. Albans. Sometimes quite unexpected things happen. I was booked to play flamenco guitar music for a private event in St. Albans and at first I thought it would be alright because it always is. People who hire me to play flamenco guitar music at their events generally know what they are booking. They were a couple who had visited Andalucia several times and had made a point of looking out for authentic flamenco. It gave me the opportunity to play the music that I really love. I was very pleased at the reactions I received. For me and perhaps for any musician it is very rewarding when we can see that our music is meaningful to our listeners. Another guest I noticed was very in tune with the rhythm and feeling of the pieces. Many years ago when Paco Pena first started playing in Britain and in other countries outside of Spain I think it was somewhat more difficult. Quite naturally people did not understand the ‘language’ of flamenco but a great deal has happened over the years in terms of people becoming more familiar with a variety of musical expressions. I am indebted to Paco Pena for his pioneering work that has paved the way for flamenco guitarists to play traditional authentic flamenco guitar music and be understood outside of Spain. After the event I heard that there were some guitarists present and that might explain why some guests seem to pay a great deal of attention. This never puts me off in the slightest; I love that there are guitarists present as indeed any music lovers. 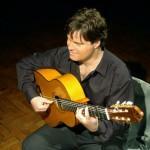 It was a wonderful experience for me to play all my favourite flamenco pieces for a great audience. I provided a performance of Solo Flamenco Guitar playing, duets and Castanets and Flamenco Dancing for a Spanish Themed Birthday Party. The organisers of the party as well as the man celebrating his birthday had all lived in Spain and spoke Spanish very well. As it was a big celebration they decided to book a Flamenco Act. They held the event in their garden but instead of grass they had decking elevated to create a stage and further attached good quality wood to the decking which was important for the sound of the dancer’s footwork. They also organised comfortable seating for their guests so that they could all watch the flamenco as a performance, rather than simply being in the background. Sometimes keeping the music in the background is the right thing to do but it was lovely for us to perform in a setting that was very similar to the traditional flamenco night in Spain. We performed several pieces from the serious flamenco repertoire such as Zambra, Soleares, Tientos, Seguiriyas, Granainas and it was wonderful that the guests listened and watched in practical silence. There is absolutely no need to do that at a garden party but it felt very rewarding that they enjoyed our performance so much. We naturally also performed several of the lighter flamenco styles such as Alegrias, Colombiana, Guajira, Zapateado, Garrotin and the gentleman celebrating his birthday joined in for the dance of Sevillanas. The way he followed the dancer with her steps suggests to me that he must have enjoyed Spanish culture in his time in Spain. It is absolutely considered right in Spain to join in with Sevillanas regardless of your level or experience in Flamenco dance. The idea in traditional Flamenco is not to compete but to enjoy the dancing experience and no one is interested in who dances best or who is still learning. I am told that the host spent the whole week cooking and preparing food and this was evident from the quantity and quality of the dinner. I received kind help from a neighbour with the lone of an extension lead which made it possible to position my amplifier in exactly the right place for optimum sound. The whole evening was a very happy experience and we were very pleased to perform for this event. 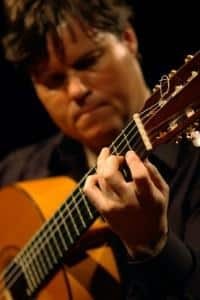 A little while back I played Spanish guitar music for a wedding and it was such a memorable occasion that I feel compelled to write my memories of it here. 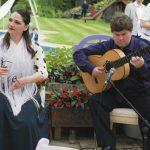 The couple getting married were both Spanish and absolutely loved Spanish guitar music. 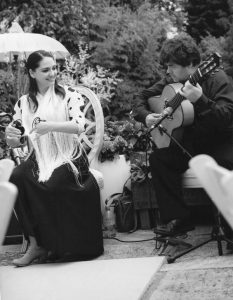 They were quite knowledgeable about the Flamenco and Classical guitar repertoire and had specific ideas for the pieces that they wanted for their wedding day. They had considered holding their wedding in Spain for several reasons and one of these being so that they could get authentic Spanish music. When they first contacted me they were very clear that they wanted high quality concert standard music. They had listened to several examples of my playing on this website and wanted to meet with me to discuss my guitar music for the whole day in detail. We decided that it would be good to have the guitar playing as guests arrived for the ceremony but it was important that the pieces should be quite peaceful and not give away what was going to happen later. For the bride’s walk down the aisle they wanted one of my pieces that sounded serious with a very clear statement. They liked the Soleares on this website very much but asked me to re arrange a section so that it would fit the timing of the walk perfectly. I was very happy to do this. For the signing of the register they wanted a happy mood but not overwhelming so I suggested the Colombiana which is of South American origin and has a kind of gentle sway with the melodies being implied rather than brash statements. As they left the ceremony they wanted me to play them out so to speak and I offered a lovely relaxing tremolo piece. I thought this was appropriate because no matter how much you love the ceremony with the taking of vows it is a formal and serious experience and it feels right to then relax afterwards. For the wedding reception which was a wonderful dinner but which nowadays is sometimes called the wedding breakfast the newly married couple wanted a proper recital of Classical and Flamenco pieces. We looked at many pieces and found those which were just right. As many musicians know sometimes you play at an event and it seems as if no one is listening or even notices you. For me it was exactly the opposite. The happy couple and their guests really loved this kind of music and asked me for several pieces that I was very happy to be able to play for them. Eventually my work finished and I took my leave with very warm memories of such a lovely wedding day. 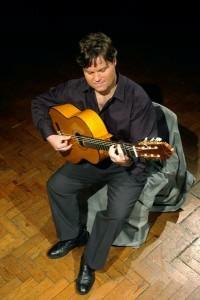 I play Classical Spanish Guitar Music for Weddings, Spanish themed events, private dinners and parties etc. 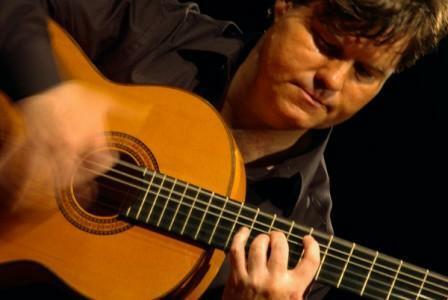 Perhaps because of my Spanish origins I started to play Flamenco guitar but over the years I developed a great love for the Spanish classical guitar. Before I discuss my classical guitar playing in greater detail perhaps I could mention this Flamenco piece, Zapateado from my YouTube page as an example of the more gentle and sensitive side of flamenco. A soft emotional melody builds into some very quiet harmonics with nevertheless accompanying bass notes that are very present throughout. Here are a few ideas for Spanish Classical Music which I hope you will find helpful. Sometimes people have a small intimate gathering of family members and close friends and they are considering hiring a guitarist to help to create a warm relaxed atmosphere. In this case I imagine that gentle, sweet pieces such as Adelita or Lagrima by Tarrega might be suitable, or maybe the Moonlight Sonata by Beethoven arranged for classical guitar. There are some very abstract pieces within what is sometimes called serious classical music. They are very difficult to make sense of; they seem to be a sequence of disconnected sounds with no apparent melody or sense of rhythm. While I am sure such pieces should be respected and indeed are studied at an advance level I am not at all sure that they would add positively to a lovely evening for special guests. On the other end of the scale I will never dumb things down. I would not want to offer tunes so simple that they can hardly be called a piece of music at all. It is possible to take a very simple and lovely melody but to build it into an arrangement that helps to bring out the theme. I do this for example with the theme from the movie Schindler’s List or with the very gentle song La Paloma by the Spanish composer Sebastián Yradier. 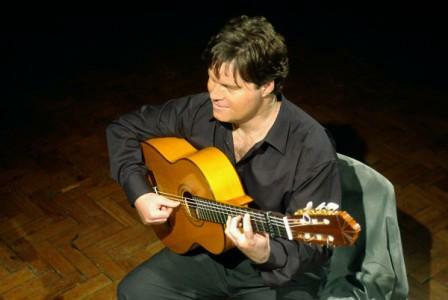 Likewise, the great Classical Guitarist John Williams made an arrangement of the piece Cavatina that certainly stands shoulder to shoulder with other classical pieces and has enough substance to keep the listeners interested without overloading with unnecessary extra notes. There is of course also the matter of how a piece is played. When I play classical I tend to let the notes speak for themselves, using techniques such as vibrato and legato sparingly in accordance with the true mood of each piece.